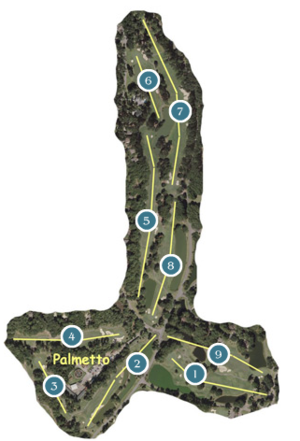 Well-positioned ponds present a challenge on seven holes of this 3,443 yard nine hole course. Conservative course management, precise positioning, and a soft putting stroke will provide you with the maximum enjoyment on these excellent nine holes. Players must avoid the tree on the right with a drive to the left side enabling an open shot to the green. Left or long on the second shot plays worse then short. A precise drive is necessary on this right fairway; aiming to the right side of the green will pay off due to the water and sand on the left, and in front of the green. A large trap and false front dictate carrying the ball well onto the green; trees on both sides can easily come into play. A solid drive is required to make this hole play shorter then it appears. The green is well bunkered in front and to the right with even more trouble behind it. The complete left side of the hole is out of bounds with the second shot requiring consideration of water on the right. The approach shot to the green should be toward the left side due to water on the right and in front of the hole. In order to reach the green a long shot over the water is recommended. The green is well bunkered on the right and can create a long putt due to its size. The fairway is open with water on the right further down and well bunkered on the left. The green is tight with bunkers on the right side of it. Water runs down the left side on the drive with a pond also on the right which is reachable for longer hitters. The green has water on the right and traps on the left requiring a very accurate approach. Sand is presented along the right side of the fairway which is open to the left. The undulated green is well positioned with water to the front and left, sand on the right and grass mounds circling it.